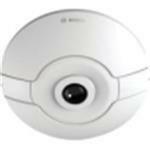 The flexidome ip panoramic 7000 mp is a discreet, aesthetic, low-profile camera for indoor use. the 12mp sensor operating at 30 fps provides full panoramic surveillance with complete area coverage, fine details and high speeds. the camera offers full situational awareness and simultaneous e-ptz views in high resolution. the 360° version of the camera, when mounted centrally on a ceiling, gives complete wall-to-wall coverage. the 180° version has a higher effective resolution and is ideal for wall mounting or for ceiling mounting in corridors. the lens captures a circular image. our dewarping software transforms this circular image into several different distortion-free rectangular views. to facilitate system integration, you can choose edge dewarping inside the camera or client-side dewarping on an external platform. the freely available video security client from bosch provides advanced client-side dewarping features. panoramic surveillance offers full 180° or 360° coverage of the designated area. because our panoramic cameras cover the full area, they provide complete situational awareness and are ideally suited to following movement in one continuous sweep.